As already reported three of the Working the Tweed team were able to attend the Biodiversity and Leader conference earlier this month. This report was compiled by Kate Foster, Claire Pençak and Jules Horne. Leader is an EU fund designed to help rural actors consider the long-term potential of their local region (more about Leader here). Leader funds are administered by Local Action Groups (LAGs), who choose priorities and select projects proposed by community groups. The reason behind this conference was that Biodiversity is a relatively low priority, and at risk of being overlooked when the targets are set in the 2014-2020 round. The conference arose from real commitment to working together across the EU, supporting local initiatives, facilitating exchange and drawing inspiration for existing projects. 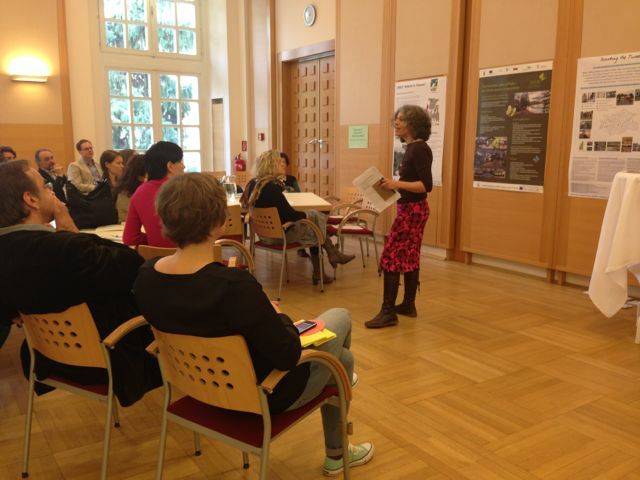 The conference was the culmination of ‘Biodiversity and LEADER’ – a project led by Austrian organisation Umweltdachverband in cooperation with OAR Regionalberatung GmbH. Several approaches to the implementation of biodiversity projects into LEADER were presented and discussed. Experts provided insights into the current status of the LEADER approach with respect to the new financing period 2014 – 2020 and informed the audience about important biodiversity topics of relevance to LAGs and local development strategies. 110 delegates attended the conference to listen to talks and to gather ideas for their own projects in three parallel poster sessions where 13 projects from 9 different countries were presented. Working the Tweed was the only UK representative and the only artist led project. The conference was specifically directed at Austrian context where most delegates came from, but hearing about other projects gave points of comparison. Power point presentations from the morning sessions , posters from the afternoon sessions and photographs of the event are available online – CLICK HERE. The proceedings of the conference will be posted shortly on the same site. All the projects presented at the conference will be featured in an illustrated printed publication which will be available by the end of May 2014. A small portion of Leader funding goes to environment projects – and only a portion of this supports biodiversity. The reality of the competition between intensive agriculture and biodiversity was recognised. Relentless pressure from developments was understood to be usually given priority over conservation, with too little regard for environmental costs and limits. It was clear that overall we should expect less EU money for rural funding – but surprising to know that significant amount of budgets never leave Brussels, in part because of the difficulty of obtaining match funding. It was universally agreed that funds are difficult to access and to administer, but hopefully improvements will be made in the new round. Changes were recommended to make it easier for smaller projects to access funds, and also to make LAGs representative of wider population. The way LAGs operate varies in each region. 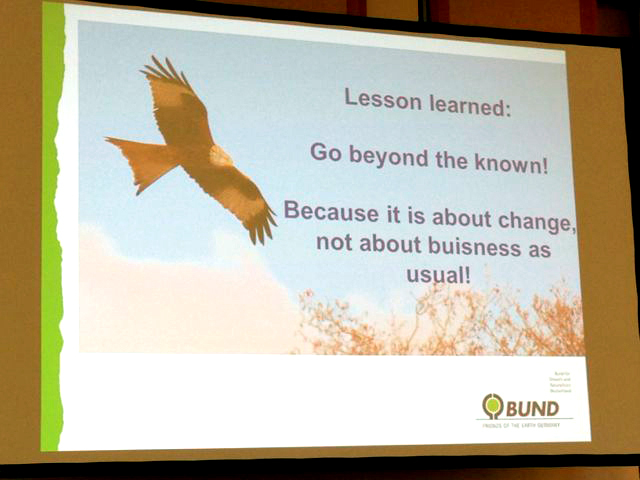 The presentation by Magnus Wessel from Bund (Friends of the Earth) Germany was particularly helpful. He reminded us the role biodiversity plays in our lives, and that matters are urgent. He cautioned us to concentrate on what was possible and to expect to deal with conflict (appropriate for the conference location – the Diplomatic Academy). Magnus pointed out the uneasy fit between LEADER competition and sustainability, and between conservation projects and the need to illustrate innovation. He drew out the need to make an emotional connection, suggesting the need for strategies for connecting with a wide public and not just specialists (particularly with young people who may go on to sustain projects). 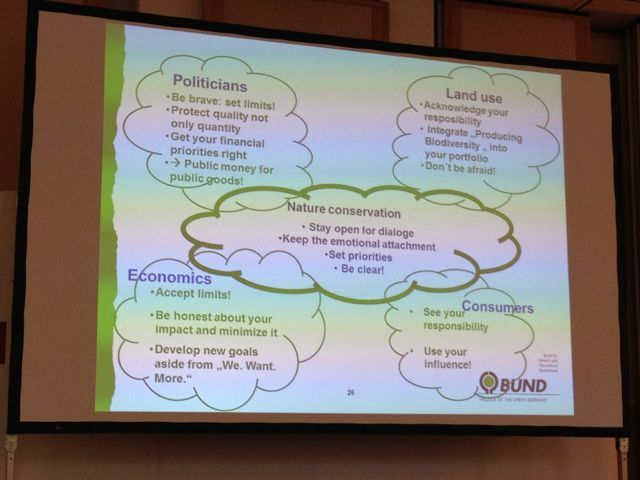 Image: slide from Magnus Wessel presentation “Local benefits of nature conservation“ vs. “Biodiversity is not for sale“ ? Parallel poster sessions allowed discussion of details that make a project distinctive, albeit within a short ten minute slot. Highlights brought out included bringing people together, and an emphasis on ‘biocultural’ landscapes. This word represents a shift towards celebrating landscapes that are culturally valued- such as cherry trees, apple orchards, meadows, and of course river-ways. Challenges identified revolved around maintaining the project over long term, and dependence on voluntary input. It was a shared experience that Leader applications and accounting were laborious – but this was a chance to congratulate those who had persisted in order to make an impact, and had found an activity that was achievable within the programme. The posters give overviews and online are a useful resource. Two projects used ‘Animal Ambassadors’. “WOLF” brings together farmers and ecologists in north-west Spain where wolves are reintroducing themselves. It seems wolves are becoming ‘fashionable’ through their efforts, and a motor for tourism and the economy. Another project from Flanders named high quality beer after Little Owls, giving them a cultural presence in an area where they are in decline. A Slovenian project raised the profile and enjoyment of traditional fruit orchards. We realised the extent of ingenuity and commitment, in finding ways for people to experience and engage with biodiversity. Harnessing local pride and connection makes things feel more relevant. This process did provide ideas and encouragement. 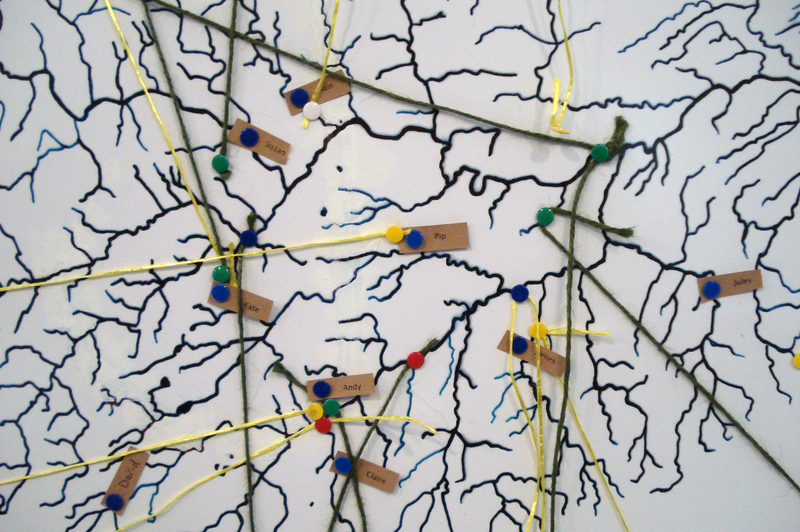 As an artist led project, Working the Tweed was seen to offer a different strategy by forming collaborative partnerships between artists and those concerned with sustainable rural development. We reminded people that we were not involved as artists to make individual artworks, but to facilitate a broader understanding of specialist knowledge that can now be integrated into creative approaches. There was interest in the idea of adopting a catchment approach, and also in the idea of a River Festival to celebrate the return of migrating salmon.